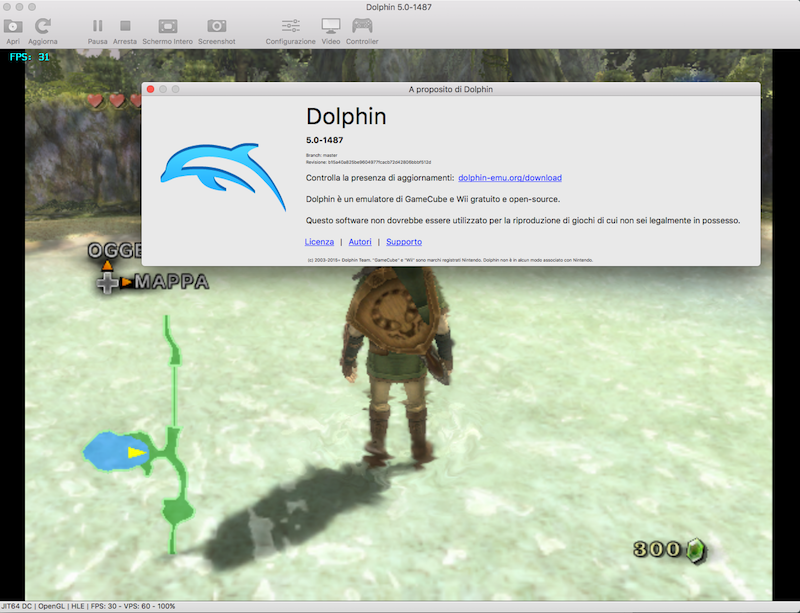 I updated to Dolphin 5.0.1644 for Mac just few minutes ago and I noticed that the map isn't trasparent but has a black background. Not only, when I close the map it remains a black glitching strip on the left side. Your graphics driver is known to be buggy and Apple isn't really supporting OpenGL actively anymore. I'm not sure if there is anything you can do, other than dual-boot another OS like Windows, which would incidentally improve performance. this problem doesn't happened with old releases of Dolphin... this is why I opened the thread. Define "old releases". Old versions didn't make use of as many modern OpenGL features to be both more accurate and faster. On good drivers, anyway. Either way, it looks like it's an issue with EFB copies. Have you messed with the graphics config settings or opened it during emulation? Around a month ago or so... not too many time. No, I didn't open/set any prefs or graphic setting during the game, I've just downloaded the last release and replaced the old one in the Applications folder with drag&drop, as usual. I swear on the Triforce. Oh, so it worked fine on a pretty recent development build? Does it still work now? If it does, can you find out which version broke it for you? Before you ask, you don't need to try out every single build released between today and ~two weeks ago. That's very inefficient. Instead, do a bisect: try the version 5.0-XXXX between 5.0-1528 and the current version. If it's working, try the version between 5.0-XXXX and the current version; if not, try the one between 5.0-1528 and 5.0-XXXX. And repeat until you find the first bad version. Yes, I've done it the same thing for an old and different problem. Tried the 5.0-1528 version and the problem appears. 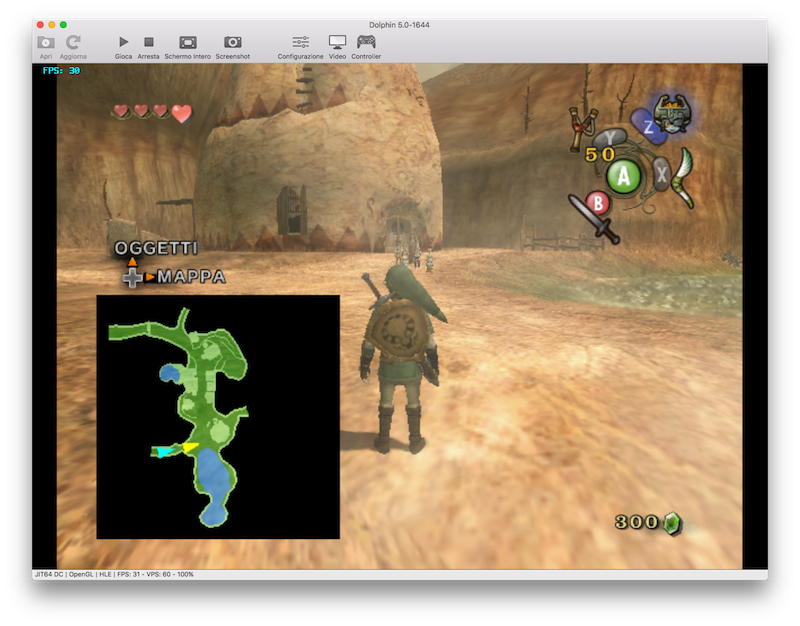 I'll try some old version before 5.0-1528 and if the problem remains I'll keep the map with black bg. Anyway I'll let you know. Ok, I've found the last release without black bg problem, is the 5.0-1487, 2 weeks and 1 day ago. Then the first release with the problem is the 5.0-1490 and (as you wrote before) with a changement in the EFB: "TextureCache: Use same color coefficients for EFB2Tex as EFB2RAM" (I don't know even what EFB is).